Are Popups Harming Your SEO? Earlier this month Google made its first major change to the way it ranks websites of 2017, marking the first of many mobile updates we are expecting this year. Google now penalises websites that use intrusive interstitials and popups on mobile devices. Google warned business owners in August last year that it was planning to penalise web pages that use intrusive interstitials, so for much of the SEO community, this change was expected. However, many businesses that did not follow Google’s advice to improve the mobile user experience have been hit hard. An interstitial is a page or element that covers the main page, and which needs to be manually removed by the user. They are used for promotions, social media sign ups, newsletter subscription forms and a whole host of other purposes. Businesses use them to try to force more interaction with a website. While they are not too much of a problem on desktop computers, many people find that they seriously harm the user experience on mobile, and it is for this reason that Google has decided to take action. Luckily, not all interstitials are bad. 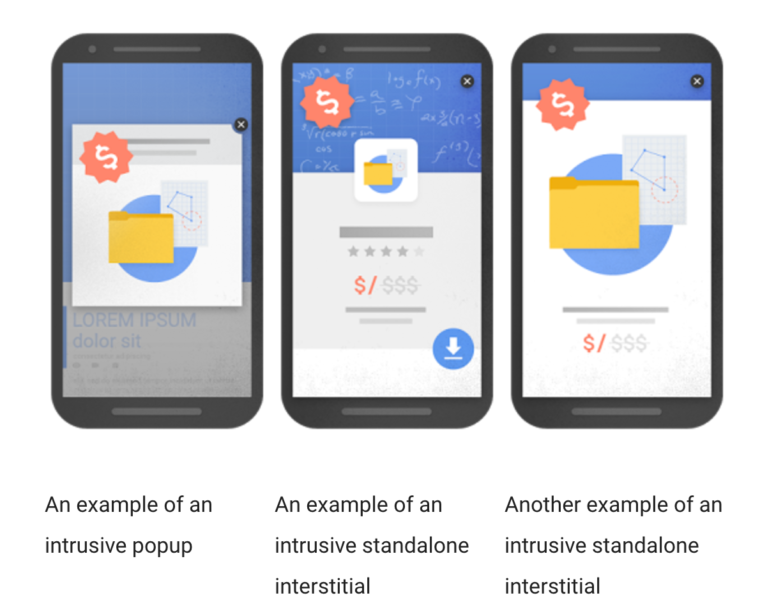 Google has said that it will only penalise “intrusive interstitials”, so small popups that only obscure a small part of the view are not likely to lead to a penalty. In the examples above, you can see that each of these formats totally blocks the content that people are trying to read. Google considers this deceptive, because if somebody is visiting a page from Google Search they are hoping to find some specific information and not a promotion for something possibly unrelated. Fortunately, this does not affect too many businesses. Google’s objective here is to put a stop to those who use aggressive digital marketing tactics to increase their rankings, but then treat mobile users differently by displaying large, intrusive interstitials. This penalty is not really new, because Google has been penalising websites for aggressive popups for some time. However, some webmasters realised a flaw in Google’s ranking algorithm – they could rank a page well by keeping the desktop version clean with a user friendly design, but make advertising more aggressive on mobile versions. Now that more than half of all searches are done on mobile devices, this effectively allowed websites to rank well on the basis of good content but then display something else to searchers. Some popups are still OK, in fact, some are actually required. For example, age verification popups, or cookie consent, are not affected by this. Unobtrusive ones are also OK, so if you have a small popup to encourage people to sign up to your newsletter, or one that promotes a new blog post, for instance, then Google is not going to penalise your website. However, if there is a popup obscuring the main content, and readers need to physically remove that to gain access, then Google will most likely issue an automatic penalty. It is important to point out that if you are affected by this you will probably only see a drop in organic search traffic – Google will automatically detect the interstitial and apply an automatic penalty, so do not expect to see a message in Search Console about this. Again, this will not affect many businesses – those most affected will likely be news and information websites that rely on aggressive adverts to generate ad revenue. This update builds on Google’s announcement last year that it will soon be operating a mobile first approach to search – if your website operates well for your mobile audience, it will also operate well for desktop. If you are unsure if your website is mobile friendly and up to the latest Google webmaster quality standards, speak to Freelance SEO Essex today and ask for a website audit and health check.